Like they always say, time flies when you’re having fun. The “Transmission” DVD was released two years ago already. BSD decided to go through and pull out the best footage and pack it into this dialed edit for your viewing pleasure. If you want a reminder of how good the “Transmission” video is, this is a good reminder. After you watch this, go re-watch the full video right here — “Full “Transmission” video! “Having missioned around the globe for two years stacking ridiculous riding clips with the BSD team on over 10 trips it’s nearly impossible to choose the best of them, but here we go. This edit marks the 2 year anniversary of Transmission’s world wide premiere in Glasgow with a selection of just some of the highlights from Dan Paley, David Grant, Sam Jones, Mike Jersey Taylor, Matt Allpress, Jason Teet, Luc Legrand, Liam Zingbergs, Kriss Kyle, Reed Stark and Alex Donnachie’s sections from the 2016 BSD Transmission DVD. The new goods from BSD are looking great for 2018. The other day we took a look at the new Kriss Kyle Passenger frame, now let’s take a closer look at David Grant‘s signature Raider frame. The 2018 Raider frame is made from Sanko Japanese seamless 4130 chromoly tubing with a 75.2-degree head tube angle, 71-degree seat tube angle, 11.75″ bottom bracket height, 9.5″ standover height and a 13.5″ – 14″ chainstay length. You can find a heat-treated, internally relieved Integrated head tube, gussets on the top and down tubes, a heat-treated Mid bottom bracket, integrated seat post clamp, an extra wide rear triangle to fit 2.40″ tires with ease, tapered seat and chain stays with curved ends for peg clearance, heat-treated, Investment Cast 7mm thick dropouts out with integrated chain tensioners and removable brake mounts on the seat stays. The 2018 Raider frame is available in 20.7″, 21″, 21.3″, 21.6″ and 21.9″ top tube lengths with Pacers Blue, Matte Raw and Gloss Black for colors and a weight of 5 lbs. even. 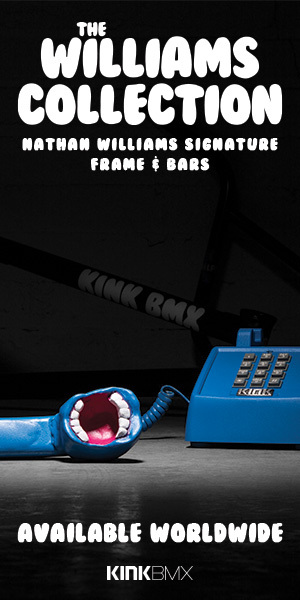 You can pick this BMX frame up through BMX shops and mail-orders that carry BSD worldwide. Heat-treated, internally relieved head tube with gussets on the top and down tubes for increased strength. Integrate seat post clamp with the horizontal cut for better clamping and extra wide stays for 2.40″ tire clearance. Heat-treated, Investment cast 7mm thick dropouts with integrated chain tensioners. Awesome artwork on this frame. 2018 BSD Raider Frame in Matte Raw. 2018 BSD Raider Frame in Pacers Blue. That’s a look at the 2018 David Grant signature Raider frame from BSD. What do you think? Do you have any questions? Let us know in the comments below! Note: This frame will be available starting “Late November” as of writing this, so it may be a few days before you will see this one popping up at shops. The BSD team decided it was time to spend some time exploring the streets of San Francisco and San Jose in Northern California. Here’s a super dialed video featuring the crew going to work on all of the amazing spots they came across from rails and ledges to huge curved wallrides and more. Everything about this video from the riding to the spots and film work is amazing, so hit that play button because this is a MUST SEE! “Join the BSD team in the streets of San Francisco and San Jose. Alex Donnachie, Liam Zingbergs, Dan Paley, David Grant and Nick Castillo head up to the bay area to cruise the NorCal streets. It looks like the Dunks Grips aren’t the only new signature product for David Grant. It looks like David is keeping the basketball theme going with BSD because he also has his signature Baller Seat that is hitting BMX shops and mail-orders worldwide. The Baller seat is a fat style Pivotal seat with a Kevlar cover and real basketball material for the rear panel with orange stitching. You can find a debossed “Baller” graphic and an embroidered BSD tag to wrap it all up. The Baller Seat is available in black with orange only and the Fat style seat only. Real basketball material on the back and an embroidered tag. Talk about a unique seat… We’re actually kind of surprised nobody has done something like this before. “Baller” debossed logo on the Kevlar material. Check out David Grants basketball inspired Dunks Grips, too. What do you think? Have any questions? Let us know what’s on your mind in the comments below! BSD have been working with David Grant on his signature Dunks Grips that are hitting BMX shops and mail-orders soon. These BMX grips are made from soft Krayton rubber with a design that is inspired by a basketball with sticky bumps. The grips are 160mm long and have a slim 27mm diameter. These are grips that are for riders that like thinner, grippy grips. Each set of grips have matching plug style barends with internal washers to help resist breaking. The Dunks Grips come in Black and Baller Orange and will be available through BMX shops and mail-orders that carry BSD worldwide starting around August 15th, 2017. What do you think of these BMX Grips? Do you have any questions? Let us know in the comments below! Reed Stark coming through with a gem of a video from some time he spent in Portland, Oregon with David Grant two years back. This mix features these two, along with a few other familiar faces getting down on street spots and skateparks around the city. Plenty of super good riding in this one, so take a peek! The Nearly BMX crew took more than one shot at spots in California for the “Nearly 4K” video. Here’s a second round of footage featuring Alex Donnachie, David Grant, Kriss Kyle and more from a trip out to California that they took to film for the “Nearly 4K” video! Much like the first trip, these guys were super productive and ended up with a TON of amazing clips from curved wallrides, ditches, ramps and more that they caught some riding time on! Hit play and enjoy! After you watch that, you can enjoy the full “Nearly 4K” DVD online RIGHT HERE! The raw cuts from the “Nearly 4K” Video continue! This time around we get a mix of raw footage from the trip to Mallorca that Alex Donnachie, Kriss Kyle, Jason Phelan, David Grant, Isaac Lesser and a few others took to stack clips. This is packed full of a ton of amazing riding, so it’s safe to say this was one of the more productive trips, plus the spots are definitely on point! Check it out!